Cycle day 3 FSH is tested to check for 'ovarian reserve' -- the quality of your eggs or 'good eggs' and 'bad eggs.' 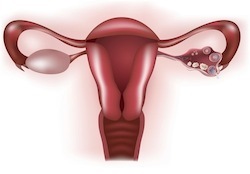 An elevated FSH could be a problem, because it may mean that the ovary doesn't respond well to FSH hormone stimulation.An elevated FSH may indicate diminished ovarian reserve. FSH is reported in "units" (mIU/ml) and results from 2-7 mIU/ml are probably normal in just about any lab. FSH levels above 25 mIU/ml are probably abnormal, and above 30-40 mIU/ml the FSH levels are clearly abnormal and probably indicative of ovarian failure. If the FSH is borderline elevated the one way is just to repeat the Day-3 test several months in a row, but this is obviously inconvenient and wastes a lot of time.The area of FSH levels between 9-24 mIU/ml may represent normal or abnormal levels, depending on how the test is performed. Adding to the confusion is that FSH bounces around quite a bit. One month the FSH result may be 7 mIU/ml and the next month it may be 13 mIU/ml. A quicker way is to use the second method of extended ovarian reserve testing, called the clomiphene citrate challenge test or CCCT.